Elvis was the iconic figure of rock from the 1950s, so famous that he was recognised around the globe by just a single name. His popularity never faded, through the Hollywood years, the comeback and the Vegas period. Even his death in 1977 didn’t diminish his fame. Since then there’s been a brisk trade in Elvis memorabilia, ranging from the plain tacky (the velvet paintings) to the excellent (automobiles, stage clothes, etc.). Next to the Beatles, there have probably been more sales of Elvis memorabilia of all kinds than of any other rock figure. He was the first star to be merchandised. At the time, since no one knew rock would last, his manager, the legendary Colonel Tom Parker, simply wanted to make as much money as possible before it all faded away, so he licensed all manner of items, even including toys. Over the years, these have become collectable bits of memorabilia in themselves – a 1956 toy guitar brought over £250 at auction. Of course, the biggest and best collection of Elvis memorabilia is at his home, Graceland in Memphis, which is now a major tourist attraction in the city. Unsurprisingly, the better Elvis items show up at auction, rather than through dealers. There’s plenty of clothing, as Elvis amassed a huge wardrobe of stage clothes. There’s still a large demand for the items, although the sheer prevalence of clothes probably keeps the price down somewhat. In 2006 a jump suit he used in Las Vegas brought over £5,000, whilst a satin cape reached £14,000. Oddly, a jacket for the tour that had to be cancelled when he died only made £200. There’s demand for everything. An early 1954 concert ad took £1,000, and Elvis’s script for the film Love Me Tender fetched £2,500 – quite a low figure really (it was sold through eBay). In fact, eBay has been a good market for Elvis memorabilia. A collection of Elvis film posters sold for £19,000 in 2002, whilst a leather jacket he’d worn hit almost £2,000. 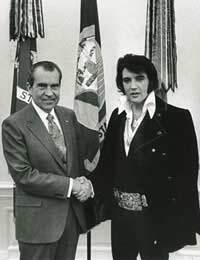 A perennial item is the famous “TCB” (Taking Care of Business) necklace – Elvis had made for his use. In gold, one with provenance can bring around £5,000. Elvis loved to collect cars, especially Cadillacs and Lincolns – the high end of American automobiles. A number of these have been auctioned off over the years, and at least one found its way to Britain, as part of the Yorkshire Car Collection, although it’s since been sold. Elvis cars sell for between £10,000 to £25,000 as a general rule – a reasonable price for vintage cars, especially ones associated with such a major star. There’s no shortage of Elvis memorabilia available, but those starting out need to be aware of all the fakes and dross around. Too much of what purports to be Elvis-related memorabilia is nothing of the sort. It’s been put together since his death, having no association with the man himself. The main thing to be aware of is that the items are unlikely to ever reach the stratospheric heights associated with other artists. If you’re looking at memorabilia as an investment, then you’re unlikely to ever lose money (although nothing is certain), but you won’t make a great deal either. The market in Elvis items increases very, very slowly. However, for an investment of a few hundred pounds, you can make a start. Vintage Elvis associated merchandise can be found, very occasionally at bargain prices. Elvis autographs are a minefield. It’s known that his signature varied over the decades, but often items were actually signed in his name by members of the so-called Memphis Mafia – his entourage. Especially dubious are those signed in gold or silver felt tip, as they’re almost certainly counterfeit. A true Elvis autograph, depending on the item on which it’s signed, can set you back up to £500. Early Elvis records, especially those on the Sun label, are collectable, but they need to be in good condition. Posters are easy to find, especially for his films, but you need to be certain they’re in mint or near-mint condition for them to have any real, sustained value. You can invest in Elvis clothing – the majority of which dates from the Vegas years – and you can find some items in the low thousands. However, consider first how much it’s likely to increase in value, and also how to store it. In short, collecting Elvis memorabilia is certainly possible, and relatively affordable. But if you’re looking for an investment, he night not be your best bet.